This year marks the 100th anniversary of when producers first made films in Hollywood. Back in 1911, when Hollywood Boulevard (then Prospect Avenue) was lined with orange trees and Sunset Boulevard was all lemon trees, Hollywood citizens scoffed when they saw films being made in the streets. 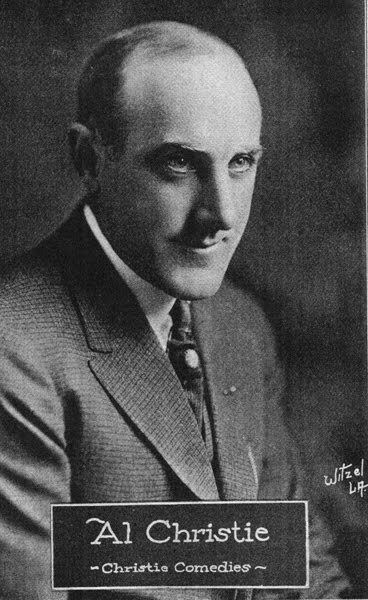 According to Al Christie, pioneer film producer, the people of Hollywood used to regard the film people as lunatics. Over the next year, Hollywoodland will profile the historic people and events from Hollywood’s first year. The following is a remembrance of Christie, who along with David Horsley, opened the first motion picture studio at the northwest corner of Sunset and Gower on October 27, 1911. “Motion pictures are a business now, but they were a ‘freak’ when we came out to Los Angeles in 1911. Hollywood was a sleepy little town of dusty roads and yellow orchards, pepper trees, and a profusion of flowers. Hollywood Boulevard seemed all orange trees, Sunset all lemon trees. The flowers and fruit were so beautiful that we tried to use them as background in every picture. “In those days we had no rushes. The films were shipped east before we saw them, to be developed. We saw the first picture we made in California three months later and we noticed, to our disappointment, that the oranges photographed black. “‘Going to stay right there?’ I asked him. “‘That’s fine, were going to move across the road and you will be out of vision,’ I rejoined. He was pretty mad. “None of us had heard of Hollywood before we came west. There were other companies in Los Angeles. D.W. Griffith was working at the corner of Georgia and Pico, where the car bars are now. Fred Balshofer was in Edendale and Selig in Glendale. A real estate agent told us he had a fine lot in a place called Hollywood. He took us out on Sunset Boulevard and while he was showing it to other members of the party I wandered away from him and across the street to what we decided upon as our first studio location. “There stood an old abandoned roadhouse [Blondeau Tavern], a low, rambling building with a big veranda and many private dining rooms. There was a big bar which we made into a carpenter shop. Margarita Fischer and Harry Pollard were given the little dining rooms for dressing rooms. A lot of others who weren’t so fortunate dressed in the old bard, where the horses had formerly been kept. Russell Bassett, the eminent actor, now dead, once said, ‘That I should come to see the day when I should dress with the horses!’ And he was serious. “Location trips meant work for everyone. Every actor used to know how to hammer and saw. In addition to doubling, loading props on and off the wagons, painting the legs of the horses when we wanted to double them, the actors build all the sets. In the winter we would stop camera shooting a half past three. Could the actors go home? No! We would say, ‘All right, boys, now we’ll put up the house for tomorrow.’ Even the women helped in their spare time. My mother made all the curtains for the sets. This entry was posted on Thursday, October 27th, 2011 at 12:56 pm and is filed under Book/Film News, Hollywood at 100!. You can follow any responses to this entry through the RSS 2.0 feed. You can skip to the end and leave a response. Pinging is currently not allowed. I think this is the only blog on my radar that is actually paying attention to the fact that Hollywood film making turns 100 in 2011! I always learn something new here at Hollywoodland, and I am really looking forward to see what gems you uncover on this year-long project of yours! So looking forward to your articles Allan, this is gonna be great!